Age doesn't always matter, but when it comes to experience, it certainly does. Serving the manufacturing, warehousing, automotive, and financial sectors -- among others. How We Get to Our Clients Has Changed. How We Treat Them When We Get There Hasn't. 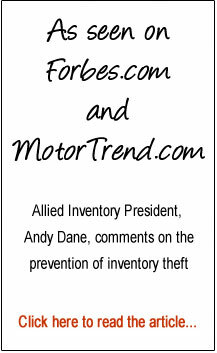 Since 1944 -- Allied Inventory introduced inventory counting to the automotive and industrial markets and have kept clients for decades based on strong relationships and trust. For over 70 years, our clients have counted on us to provide accurate, professional and worry-free physical inventory services. Click here to learn more about Allied Inventory and the people behind the company. Whether your business is in the manufacturing, warehousing/distribution, automotive or financial sector we can help. When it comes to inventory counting, more industries count on Allied than any other firm. Click here to read more about the services we provide, including Chicago, Detroit, and Milwaukee inventory counting services. Why should you hire Allied Inventory? Simply put, because it can save you time, money and aggravation. Click here to find out how. Whatever your inventory challenge, we pride ourselves on partnering with you to solve it. Click here for contact information. Allied Inventory © Copyright 2015-2018. All Rights Reserved.